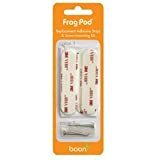 This kit contains one set of replacement adhesive strips (4 strips), two screws and two wall anchors, plus directions for re mounting your Boon Frog Pod, Bug Pod, or Whale Pod using either option. For wall mounting, adult assembly required. I love the frog pod. I mean, I would love it if it would stay on the wall in the bathtub. I’ve bought these replacement adhesives before, and I am not going to again. If you want it to stay up, you’re going to have to screw it into the bathtub wall, which we really do not want to do and so the frog pod went into the garage sale pile. It’s too bad, it’s a really great idea. We got this frog secondhand and were using the suction cups, and it kept falling down. I bought these, followed the instructions to the letter, and voila! It hasn’t fallen since, and it’s been months. It’s on the wall of a fiberglass shower/tub combo, and on an interior wall.